Wednesday 17 April 2019, 11am - 3.30pm. Soundplay Dome space in the Piazza shopping centre in Paisley (all participants will meet at Paisley Arts Centre which is very close). Places on the this workshop are free and will be allocated on a first come first served basis. To book your place email us at applications@imaginate.org.uk with Soundplay Dome workshop as the subject title. 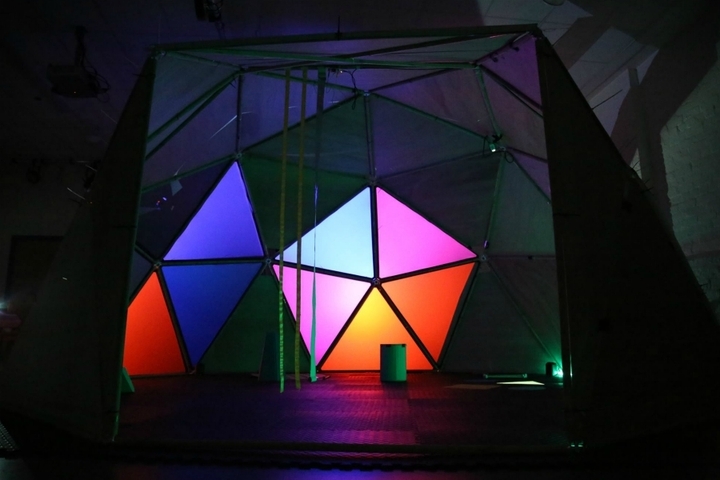 Imaginate in association with Paisley Arts Centre are delighted to be working with the Soundplay Projects to offer artists the opportunity to learn more about sensory spaces for young audiences. Created by visual artist Ewan Sinclair and musician Bal Cooke, the Soundplay Dome is an accessible interactive musical sensory space. Taking the form of a 5-metre diameter geodesic dome, the space uses tactile interfaces and projection mapping to give audiences an accessible creative experience. All workshop participants will be offered a complimentary ticket to Achilles by Company of Wolves which is on that same evening at Paisley Arts Centre. This workshop is part of the Artist in Residence with Paisley Arts Centre supported by Imaginate with funding from Creative Scotland.